Reflektor is the fourth studio album by the Canadian indie rock band Arcade Fire, released on October 28, 2013 by Merge Records. The album debuted on number 1 on the Billboard 200 Chart. Prior to the release of their new album Reflektor Arcade Fire had been playing a string of small shows in Montreal, Brooklyn, and Miami under a different name—The Reflektors. In early August 2013, a cryptic logo, which incorporated the word ‘reflektor’, appeared on the walls of cities around the world. The street art was reported to be part of a guerrilla marketing campaign for the new Arcade Fire album. The upcoming album and its release date had already been announced via a message on Twitter, written as a reply to a single fan. An Instagram account posted pictures of the symbol, and included a video of one being drawn. 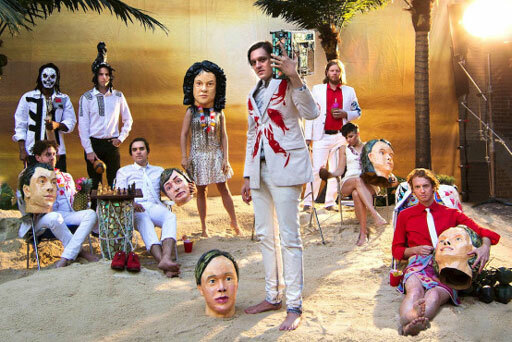 On August 26, Arcade Fire confirmed that the work was related to them, with a large mural on a building in downtown Manhattan, which included four of the symbols and the words 'Arcade Fire 9pm 9/9'. The band released a 15-second music clip on Spotify on September 2, 2013, titled ‘9pm 9/9’ under the album name Reflektor. On September 9, 2013, the band announced a last-minute secret show under the name The Reflektors at Montreal's Salsathèque Club, at 9PM for $9. Band member Win Butler later wrote that the reflektor graffiti was inspired by Haitian veve drawings. The build-up to the release of the album was described by Pitchfork as 'unusual, ambitious, vague, confounding, a little heavy-handed, and very successful'. It was compared to similar campaigns as those of albums by Daft Punk and Kanye West, also released in 2013. In such campaigns, the music itself becomes one part of a wider experience. Although the events surrounding the album's release take place in the real world, their impermanence suits the use of social media, where the campaign is documented and shared. In an interview, Butler stated that he enjoyed anticipating the release of an album, and that the build-up to the release of Reflektor felt like 'a weird art project' or 'throwing a good party'.